The visor seems a bit...wide. 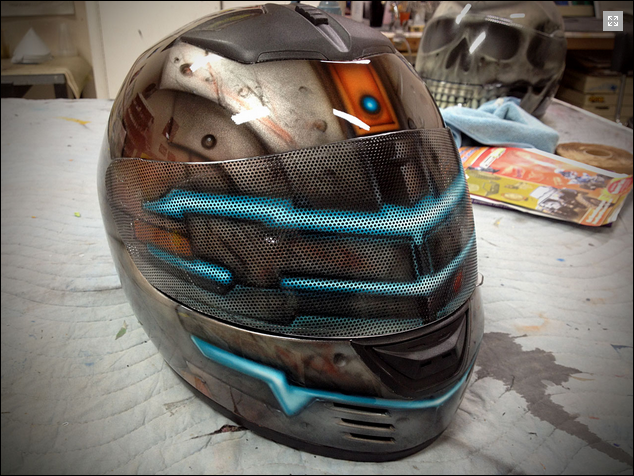 Oh it's just a painted regular helmet, well it is still cool but this can be done much better with some cosplay elbow grease. 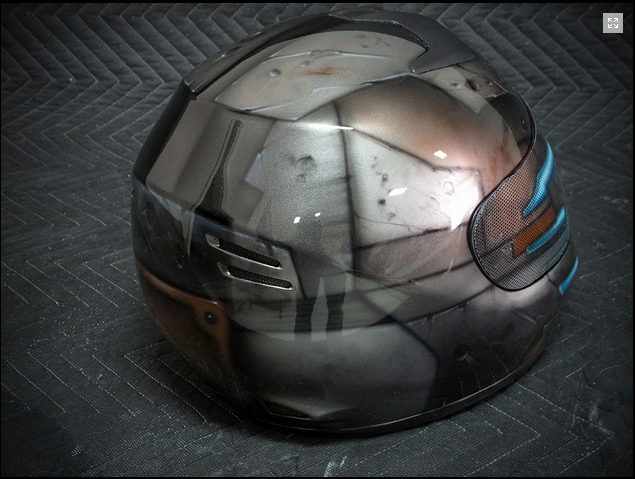 Looks nice but you have to wonder how much it restricts your view, even a simple clear visor on a full face helmet is claustrophobic as hell and narrows your view. I wouldnt want to ride much with a view like that (not that I ride anymore at all). 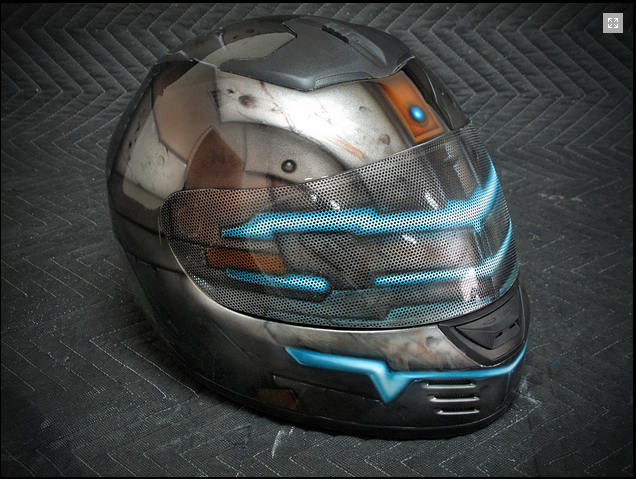 It could be done better by cosplayers, but could their helmet also function as a safe motorcycle helmet? 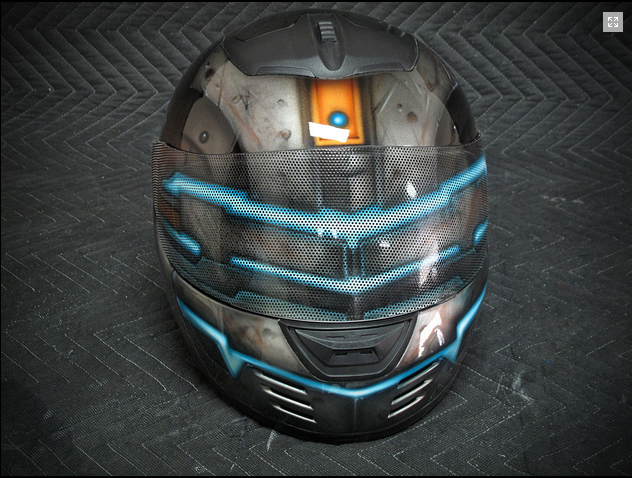 OT: It's pretty cool looking, but it looks a bit off with how far the blue visor stretches across the front. I'd rather see an N7 helmet. That would be awesome. 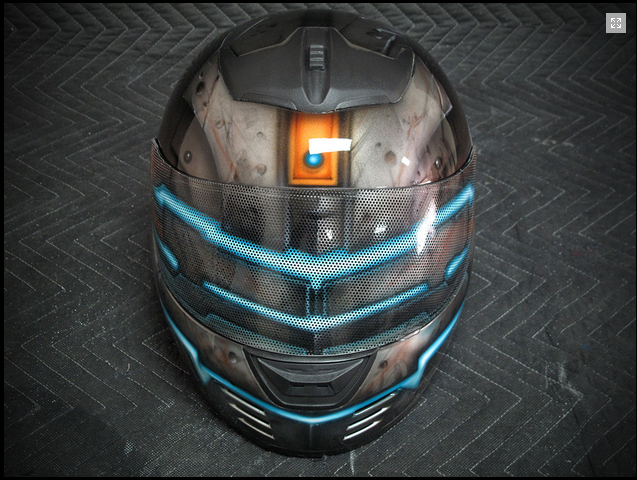 As a motorbike rider myself, while it is cool to have a helmet like this. I personally wouldn't wear it when riding due, despite the fact that the shield is perforated. Due to the fact that when riding, you need to make sure that you see every possible threat to your safety, as you cant expect that all the other traffic has seen you. I wouldn't use any helmet that takes any possible visibility away from the rider. I don't think its even legal to use a Visor like that. To dark stained transparent visors aren't even allowed. If you want to ride in style, then go al the way. Is that a thing in USA? Here in the EU, you can use a large variety of dark visors. In the sunnier months, I use a dark tinted one, since I'm somewhat light sensitive. It doesn't make sense to me that you shouldn't be able to use a visor like that. You are alowed to use a sun visor yes, but only with day light, you can be fined using them at night time. And there are limits for how dark they can be, completly blackt out visors (or car windows for that mater)are to my knowledge not legal. Huh, I thought there were universal regulations in EU on tinted windows/visors, maybe it's just helmets. I'm not sure which visors you mean or if the one in the article falls under that category, I just know that my visor is dark to the point where I was advised not to use it, but since it's sold in authorized dealerships, it's unlikely to be illegal. I assume you're allowed to drive with the visor open at night and not get fined for that..? It being sold in authorized dealerships doesn't necessarily make it legal. They often also sell motorsport equipment, not to be used on the road. Hell, a lot of car gatgets at the Gas station aren't even legal to use. And traffic laws are mostly regulated by the country's themselfs, so it may vary. Legal or not, i'm pretty sure you get pulled over if you wear it. I don't prefer to ride with an open visor as much as others seem to do. so for me not really an option. Note to author and all others: it's spelled ISAAC, not ISSAC. I've been battling against this misspelling for my entire life and am seriously tired of explaining that no one spells it that way. It's as easy as the 2 seconds that it takes to google it and then google will tell you "did you mean Isaac?" They have quite the impressive collection of sweet helmets. While I do have a full helmet for riding in the winter months I don't like it. I cuts off the edge of my peripheral vision and that drives me nuts. I'd like to see what they could do with half helmet though I'd imagine that they are probably stupid expensive. Some US States don't even require a helmet. Not bad at all, but I'd still like to see a Necromorph jacket you can wear while riding and actually have leather tenta-limbs to swipe at passer-bys.